Joseph Julian appeared on thousands of radio broadcasts before and after WWII. He fought the accusations made against him during the McCarthy era. He also appeared on the NY stage. Joe Julian was a hero to many and I always thought his radio work was particularly outstanding. I had the opportunity to correspond with him after his book came out. He was very gracious and I sent him some shows of which he said he had never heard. "How strange to hear myself again after all these years." He was most proud of his work with Norman Corwin and suggested "Hearthstone of the Death Squad was the worst show on the air." 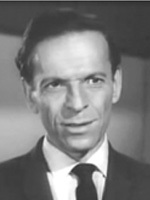 Joseph Julian starred in "Peter Gunn" -- one of my all time favorites.